Anyone who enjoys cold weather camping can tell you about its many benefits: no bugs, no crowds, and an extreme peacefulness and beauty that is difficult to experience any other time. But of course these benefits don’t come free, and the primary challenge in winter camping is the simple necessity of keeping warm, especially while sleeping. At Enlightened Equipment, we like to rely on a very simple yet versatile method to hit sub-zero temperatures: layering multiple sleep systems. For those who only occasionally do winter trips, the first benefit is simply cost. By using two sleep systems (typically one for summer and one for shoulder seasons) you actually get three temperature ratings. For example, if you have a 40°F quilt for summer use and a 20°F for the shoulder seasons, you can use each independently, and then in winter combine them for a -10°F rating. Both sleep systems combined would often still come in at a lower price than a sleep system rated to -10°F. For reference, below we’ve included a chart to calculate the approximate ratings of combined sleep systems. Note that these ratings are limit temperatures, and cold sleepers should adjust their sleep systems based on their own needs. See more about our temperature ratings. Use below 0ºF should be limited to experienced users. 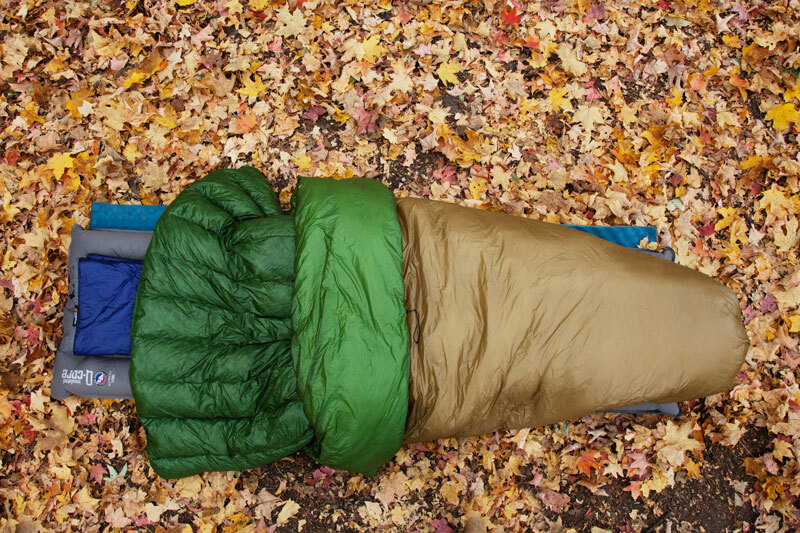 Any time a sleep system is used, you MUST include adequate sleeping pad and head insulation. Please use caution when spending time outdoors in very cold temperatures. Keep in mind that using either quilts or sleeping bags below -10°F requires some experience using them and requires well-thought-out insulation for your head and face and a very efficient sleeping pad insulator underneath you. See more information about sleeping pads. When camping in the cold, bring warm baselayers, plenty of insulating clothing, and hot food. Make sure you have quick access to your vehicle if something should go wrong, and inform friends or family of your whereabouts. While any two of our solo systems can be used, one of the most popular combinations is to use a Revelation APEX as the outer quilt, and a Revelation or Enigma as the inner quilt. The reason for having a synthetic quilt on the outside is that whether we're awake or asleep, we’re always releasing a certain amount of moisture. In very cold weather, this moisture cools very quickly, allowing the water to condense into droplets, perhaps even before it is able to pass all the way through your insulation. A synthetic outer quilt can manage this moisture much better than a down quilt and can continue to offer a higher level of insulation when damp. You can learn more about the differences in insulation type here. However, most of the time, the heat you create in your sleep system will be enough to push the moisture out and keep your down dry. If you do find that you need some help keeping condensation off of you, try using a vapor barrier to help block the moisture (such as a plastic or foil blanket, a rain jacket, etc…). When using two quilts, keeping everything in place couldn’t be simpler. In order to keep everything held together in cold weather, EE offers the Sub-Zero Strap, which allows you to attach two EE sleep systems to your pad at once. Keep in mind that a tight-fitting quilt may not loft as fully as it should be to hit its temperature rating, so the quilt used on top may need to be somewhat larger to allow a good fit for the quilt below it. We typically advise folks to go up one size for the top layer. This style of sleep system doesn’t necessarily need to include two quilts. Using a sleeping bag or mummy bag along with one of our quilts is also a very effective way to add some versatility to your kit. Many users may find it surprising to even consider using one or more sleep systems in cold weather at all, typically for concern about drafts. A well-fitted quilt should offer enough coverage to keep drafts blocked out and leave some extra space for insulated clothing layers. Because there’s no zipper (which can be very frustrating to use with gloves on), getting under and out of the sleep system, or even two is as simple as using a blanket at home. This makes late-night trips much less clumsy than when you’re using a tight-fitting mummy bag in cold weather, and if you’re wearing a Hoodlum or something similar, you have the added benefit of taking your head insulation with you. Ultimately your gear kit should serve the specific trips you find yourself on. For some, that will mean having a dedicated sub-zero bag, but for many of us, the layering system will be completely effective to reach those temperatures when we find we need to. The advice you’ll find on Enlightened Equipment support pages is just that—advice—and isn’t a substitute for proper preparation before you go into wilderness areas. Know your limits, do your research, and test your gear in safe locations before you thru-hike. Outdoor activities, while awesome, are undertaken at your own risk.